On Thursday, November 9th we met at Frank's in Stillwater. Frank has a very large finished basement, that once was a living area. Now it's a living area for Frank's railroad. 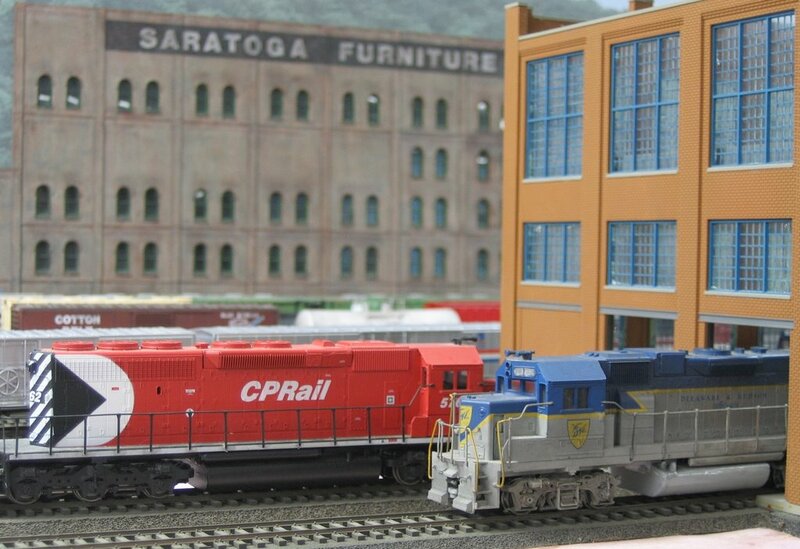 Frank's layout is a free-lanced modern era railroad using Saratoga, NY as a base. Frank likes the more modern era D&H/CP. 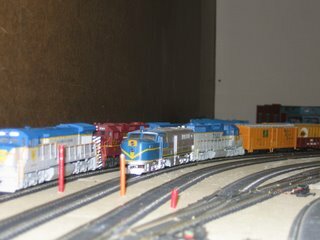 You'll see an mix of GTI, CSX, NS and even B&M motive power. 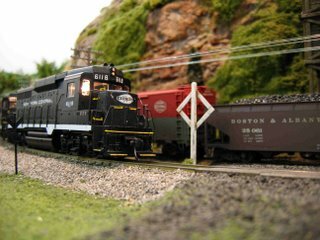 You can find from SD70's and AC4400's to BL-2's and steam in Frank's fleet. 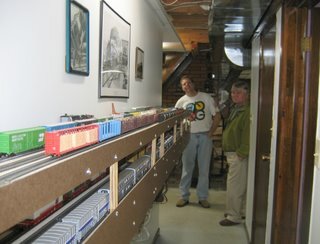 Frank uses Digitrax DCC to run the layout, some of the fleet even has sound too! 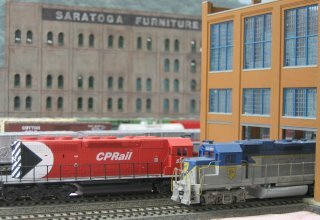 With 90% of the trackwork is complete, Frank is focus on starting scenery, working on a free-lanced version of Saratoga, and a large paper mill. 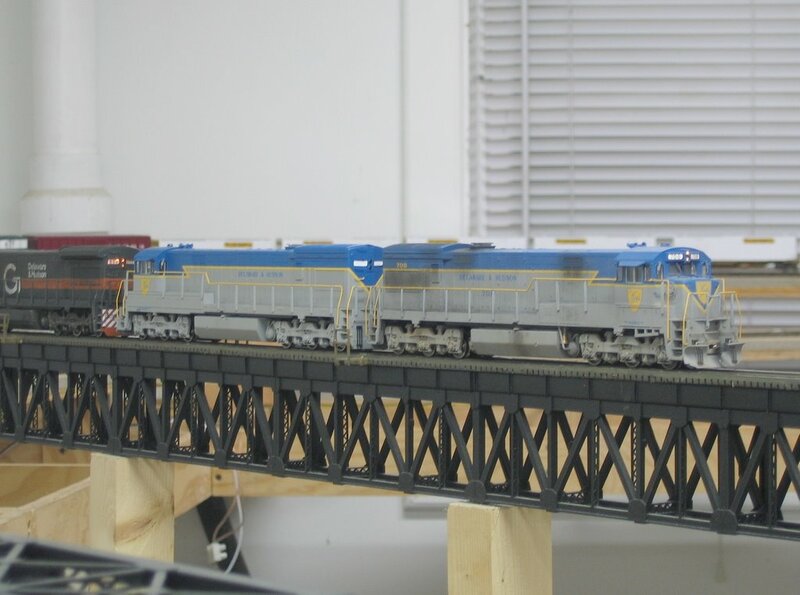 Frank kitbashed a single track version of the Hudson River bridge in Mechanicville. Frank and Bill Hickey check out the north/south staging yards. 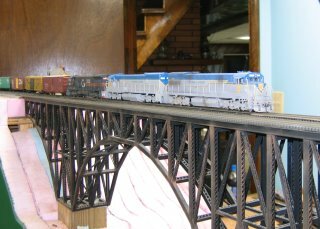 The entrance into Frank's train room is this massive double-track bridge he scratch-built. A shot of Saratoga Yard with Quad Graphics on the hill behind it. By far Bob has the most complete layout of the group. Again this layout was just bare benchwork when we started. Bob finally took the plunge and let me start scenery on it. He was in shock when he saw a giant "pink" Styrofoam mountain to the ceiling and wasn't sure if this was a good idea! 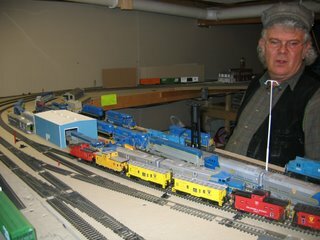 He wired the layout for DCC using Digitrax and away we went. Bob loves to build interesting laser cut kits, 95% of the buildings on his layout are wood craftmans kits. Years ago he started collecting pre-built buildings and then decided he could build them himself. 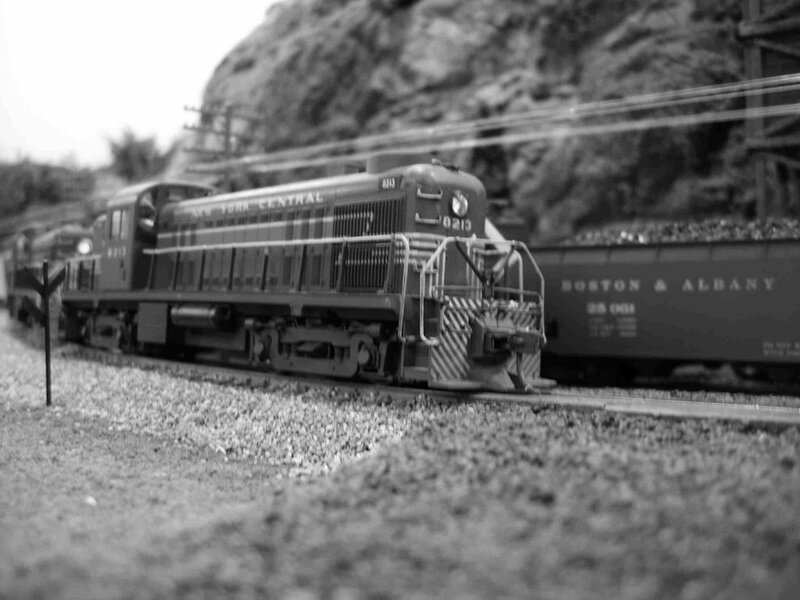 The layout is a steam-diesel transition period, on a fictious stretch of the Boston & Albany. It features a main yard, a city, rolling country side to the mountain and back. The focus now is to detail the hell out of the layout. 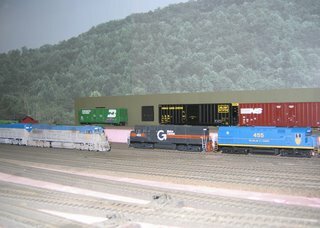 This winters project will be to add a large staging yard to the layout, and of course we will post pictures of this! I should have Brad write his own article on the D&H/Adirondack Southern. It needs some explaining, but basically it's focus is on Mechanicville, Colonie and Round Lake Branch of his Adirondack Southern. Brad moved to a new house and took the old layout with him. 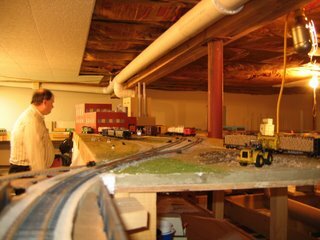 He is recreating the old layout in a larger, much nicer basement. 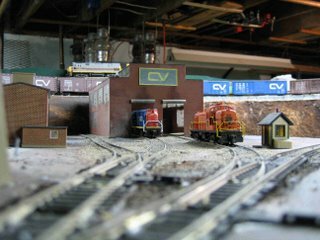 These are just a few pictures of the old layout before it was torn down, fortunately Brad really hadn't started scenery yet! On November 2nd some of the members got to see Brad's work in progress, and those updated picutres will be on here soon. Bibby checks out the fleet! Bill Hickey is a retired teacher and former fireman for the D&H. 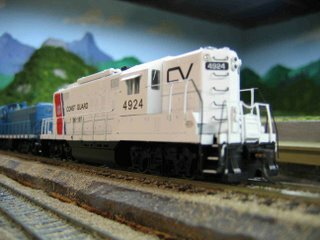 He models the Central Vermont and custom paints most of his locomotives and rolling stock. Bill's layout is a small folded dog bone. When he started working on the layout, it was all benchwork. 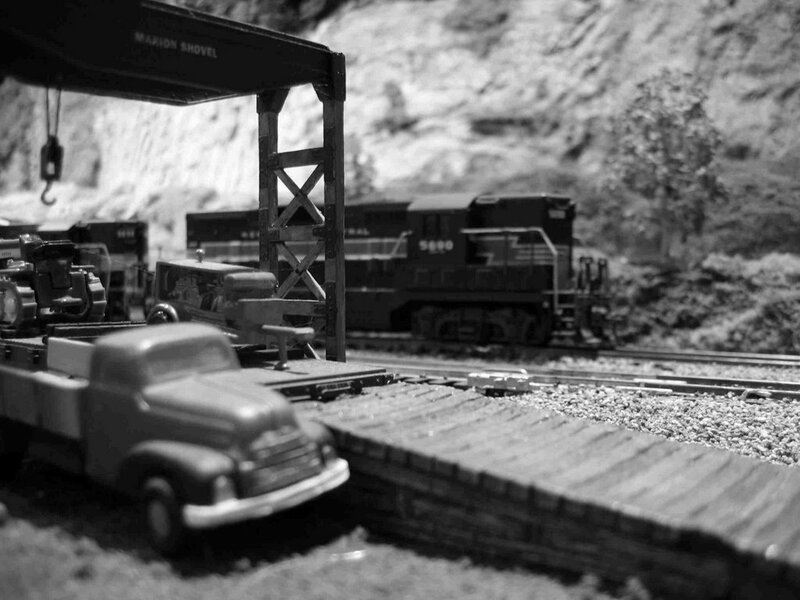 We wired and added scenery to most of the layout under his direction of course! With most of the trackwork complete, scenery needs to added around the engine terminal and and a large industry will be built on the hill in back of it. 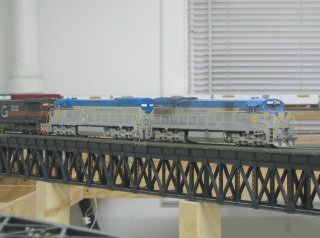 We'll visit this layout again and have progress of the work. 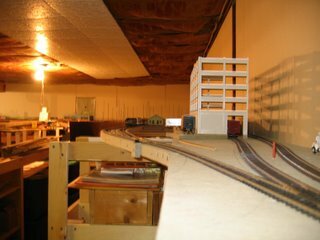 The Thursday Night Round Robin started many years ago with beginnings back to the Mechanicville Model Railroad Club. Club meetings were generally on Thursday Nights. 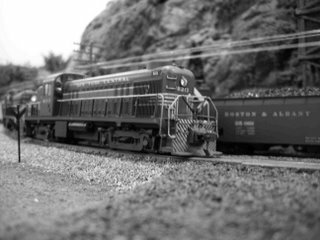 After the club disbanded we would go train-watching on Thursdays, often to Amsterdam or Voorheesville. A few years ago we started a round robin with former club members and picked-up a few new members along the way. 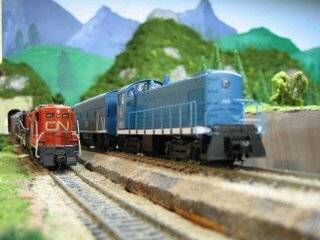 I would like this to be a way for us to share photos and thoughts on model railroad projects under way, give advice and share criticisms.